River Valley sophomore Kaylee Gillman (45) releases a shot attempt over an Oak Hill defender during the first half of Thursday night’s non-conference girls basketball contest in Bidwell, Ohio. BIDWELL, Ohio — The turnover bug bit the Lady Raiders again. 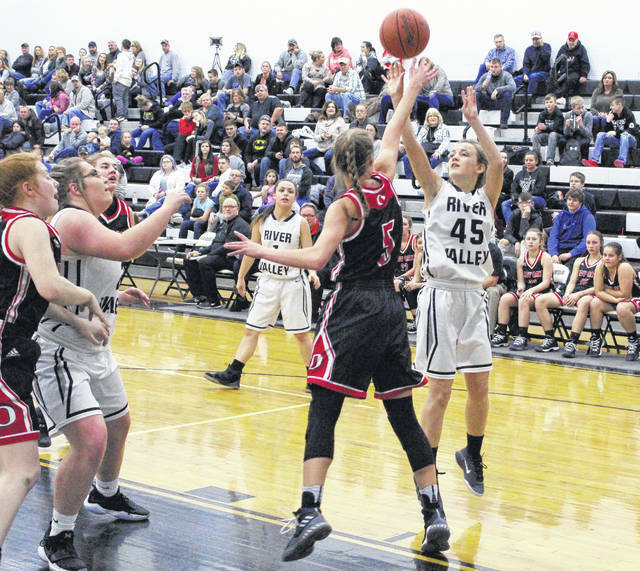 The River Valley girls basketball team averaged a giveaway a minute as visiting Oak Hill rolled to a 63-31 victory on Thursday night in a non-conference contest in Gallia County. The Lady Raiders (0-10) led for 12 seconds in the opening canto, but the hosts ultimately committed more turnovers (22) than the total number of shots they attempted (21) in the first half — and the Lady Oaks (7-3) made them pay for their mistakes. OHHS — which trailed 4-2 following a Beth Gillman basket at the 5:47 mark of the first period — claimed a permanent lead with 5:35 remaining in the opener after Caitlyn Brisker nailed a trifecta, sparking a 16-2 charge the rest of the way that allowed the Red and Black to take an 18-6 cushion through eight minutes of play. The Silver and Black — who committed 11 turnovers in each of the first two stanzas — made a small 5-3 run to start the second canto, but never came closer than 21-11 following a Kelsey Brown bucket with 6:38 left in the half. The Lady Oaks countered with a 23-3 surge the rest of the second period and cruised into the locker room with a sizable 44-14 halftime advantage. Oak Hill — which netted 23-of-43 shot attempts for 53 percent through three quarters — led 59-20 headed into the finale and ultimately claimed its largest lead of the night following a Kody Wright basket that made it 61-20 a minute into the fourth. The Lady Raiders answered with an 11-2 charge the rest of the way to wrap up the 32-point outcome. 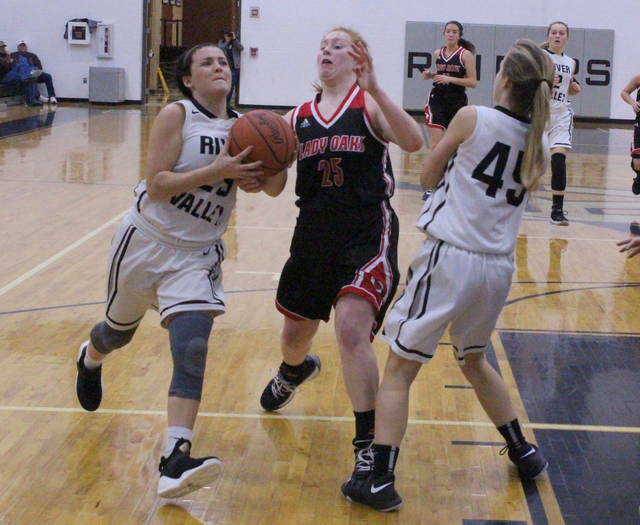 River Valley outrebounded the guests by a 28-25 overall margin and claimed a 13-7 edge on the offensive glass, but 32 turnovers eventually came back to haunt the hosts by night’s end. The Lady Oaks also turned the ball over 23 times, with eight of those coming in the final stanza. It was a tough night for second-year RVHS coach Stephen Roderick in facing a program that is perennially known for its pressure defense. His troops never quit, which he acknowledged, but he also noted the importance of valuing possessions — something that his girls just didn’t do during the opening 16 minutes of regulation. “Tonight was just Oak Hill being Oak Hill, a program with a reputation of forcing mistakes and making you pay for them,” Roderick said. “We knew tonight was going to be tough from the start because we’ve had problems with turnovers. When things started getting tough for us, we just didn’t handle the pressure well. The Lady Raiders never managed more than two field goals in the first three quarters and never shot better than 27 percent from the field in any one canto — which happened to occur in the finale. Overall, the hosts connected on 9-of-43 field goal attempts for 21 percent, including a 1-of-5 effort from behind the arc for 20 percent. The Silver and Black also went 12-of-19 at the free throw line for 63 percent. 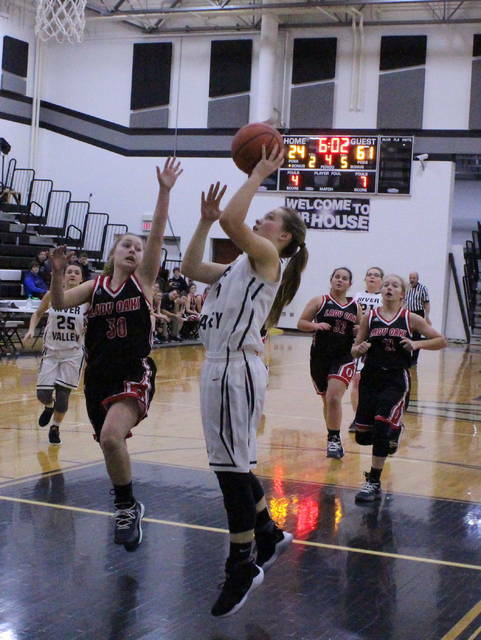 Kelsey Brown led the River Valley with 16 points, followed by Beth Gillman with 11 markers. Hannah Jacks and Carly Gilmore also had two points apiece in the setback. Brown led RVHS with a game-high eight rebounds, while Jacks, Beth Gillman and Kaylee Gillman each collected four caroms each. The Lady Oaks netted 25-of-54 shot attempts for 46 percent, including a 6-of-14 effort from three-point range for 43 percent. The guests also went 7-of-14 at the charity stripe for 50 percent. Payton Crabtree led OHHS with a game-high 20 points, all of which came in the first half. Olivia Clarkson was next with 12 points, while Brisker and Bailey Ward respectively added 11 and eight markers to the winning cause. 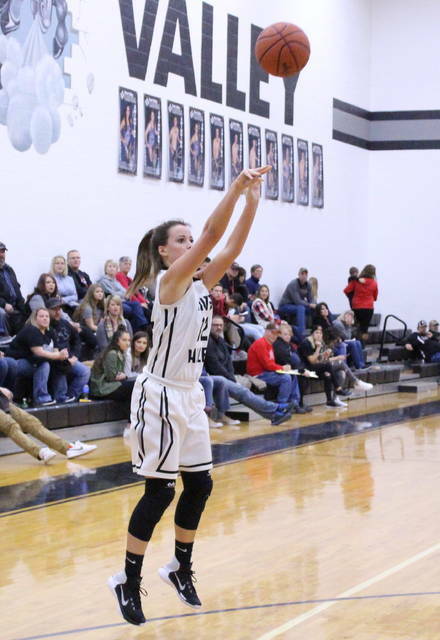 Baylee Howard was next with six points, with Wright and Peyton Miller completing the winning tally with respective efforts of four and three markers. Clarkson led the guests with five rebounds, while Ward and Brisker each grabbed four boards. River Valley returns to action Thursday, Jan. 4, when it travels to McArthur to face Vinton County in a TVC Ohio contest at 6 p.m.